Extremely cold temperatures are a challenge to keeping industrial equipment and processes working at optimum levels. Fit Tight insulation covers with heating elements can prevent costly damage to equipment and shutdown of temperature-sensitive industrial processes. Fit Tight insulation covers with heating elements meet the challenge when equipment needs to be protected from cold and freezing temperatures but does not have an inner heat source. 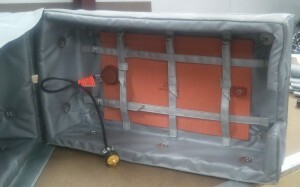 Fit Tight’s insulation blankets with heating elements are custom-fabricated with electrical heating components to meet your insulation needs exactly. This long-lasting cover is a very smart way to avoid the cost of heat tracing, hiring an electrician or installing a thermostat. In addition to saving energy and protecting equipment, the cost of our removable covers with heating elements is significantly lower than standard field alternatives for preventing freezing. We also manufacture Fit Tight custom designed insulation covers with heating components capable of maintaining precise process temperature required for your applications. So process quality and accuracy is not affected by fluctuations in ambient temperatures and equipment is protected from costly damage. In addition, your Fit Tight insulation covers with heating elements are designed and manufactured for durability, maximum coverage and protection, and are easily removed by your maintenance team for off-season storage or for equipment inspection and maintenance. Then the covers can be quickly and easily reinstalled, saving expensive downtime and maintenance costs. Fit Tight is committed to providing the quality insulation covers our clients’ applications demand. Fit Tight design engineers will visit your site and evaluate your requirements for thermal insulation covers. They will design the custom insulation covers with heating elements required for any installation configuration, temperature range, and access needs in your plant. Then our manufacturing engineers will assure that the covers you receive are durable, long lasting, and specifically designed and manufactured to provide optimum equipment temperature, protection, and insulation. Let Fit Tight be the solution to your requirements for insulation covers with heating elements. For more information or to schedule a consultation, you can contact our team here or request a quote for your specific thermal insulation covers.